The FCX2000 Series is the ultimate solution for package prototyping and short production runs of rigid materials without the use of a cutting die. With Graphtec’s medium to large flatbed cutting plotters, you have the right tool for contour cutting without requiring a die. Reduce media waste and processing time with included, dedicated software.Users are empowered to create custom orders at low cost with short delivery times. Redesigned Y bar and cutting table deliver high precision cutting and creasing. New dedicated design software and plug-ins provide all of the tools necessary to create elegant, professional products. Using offline USB operation, even the most novice user is set to operate directly from the machine - without the use of a computer. USB operation enables operators of all skill levels to process various types of media for cutting. Having a designer create the plot file, it can be passed to users of any experience level to produce. Simply insert the USB and select the file from the intuitive new 3.7 inch Graphic LCD screen. The corresponding cutting conditions are automatically applied and the job is produced. Similarly, barcodes can be generated for print and cut applications. Cutting data is automatically selected from USB flash memory by scanning the generated barcode printed on the media to preform contour cutting. This reduces the potential for mistakes by the operator. ons to ensure precise cutting. Version 6.0 is packed with high productivity features such as ARMS Copy, One Point Compensation, Scan Start Position, and Expanded Cutting Area capability. Graphtec’s Cutting Master 4 plug-in for Adobe Illustrator and CorelDRAW is used to send cut designs, as well as control parameters of the plotter. This is where registration marks can be added, large designs tiled; matrix copies created, and weed lines added. Graphtec Pro Studio design software offers an array of design tools and extensive file format compatibility – including EPS, CMX and PDF. In addition, Graphtec Pro Studio PLUS is an upgrade to unlock advanced features such as true shape nesting, arranging the cut order of objects, and rhinestoning. Dual head design delivers 500G and 1000G of force at speeds up to 400mm/s. Process materials thick or thin – including: rubylith, static cling film, vinyl, rubber sandblast, diamond grade reflective, chipboard, E flute*, and more. 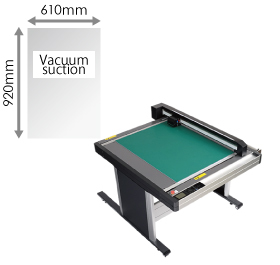 Three table sizes of 36”x 24”, 36” x 48”, and 36”x 72” are available utilizing enhanced vacuum suction media hold down. 3 different table size with choice of vacuum suction or electrostatic media-hold down methods depending on application. Distance between the holes has been improved from 30 mm on FC2250 Series to 20 mm on FCX2000 Series, as a result, FCX2000 Series provides stronger suction power to hold heavier and thicker medias down. The FCX2000 series has 2 tool holder in the carriage. without exchanging a tool at the same time. it can increase work efficiency. Dual Tool Holders which can hold a cutting blade and creasing tool — to produce creases/folds and cuts on the same run. Onboard control and settings are simplified using the equipped 3.7” LCD (240x128 dots) and tactile control panel. A new, dedicated emergency STOP switch is at the ready. Supports a dedicated stop switch for stopping the machine when emergency case is occurred. The FCX2000 comes equipped with a mounted roll-media stocker. Supports media width up to 37.4” and weight up to 11 lbs. When performing contour cutting, also known as “Print & Cut”, the cutting data is automatically selected from the prepared USB flash memory. The FCX2000 scans the bar code printed on the media then automatically performs the contour cutting job. This emerging method helps to prevent operator error of using incorrect data - thus improving workflow efficiency. *1. Available in a limited region. Please contact your local representative of Graphtec. *3. Pump (blower) for vacuum suction media hold-down system is not included. *4. For more information about Windows and Macintosh compatibility, please check the website or contact your local representative of Graphtec. *5. The software can be used by downloading from Graphtec website. Main body is packed in a cardboard box, and then it is loaded on the pallet. Leg with a caster for the stand is packed in a cardboard box. It is not loaded on the pallet. The bar for connecting the right and left legs of the stand is packed to the main body. Cutting blade CB09UB 0.9mm dia. 45º, Supersteel Self-adhesive marking film (vinyl, fluorescent, refractive), thin sheet, up to 0.25 mm thick. CB09UB-K60 0.9mm dia. 30º, Supersteel Thinner film (Tint film), 0.03 mm to 0.25 mm thick. CB15U 1.5mm dia. 45º, Supersteel Rigid or thick film or sheet, heavy paper (pattern paper, oil board), 0.25 mm to 0.5 mm thick. CB15U-K30 1.5mm dia. 60º, Supersteel (Japan 30º) Rigid or thick sheet, 0.25 mm to 0.5 mm thick. CB15U-K20-2SP 1.5mm dia. 80º, Supersteel (Japan 20º) Sandblast resist rubber, up to 1.0 mm thick. CB15UA 1.5mm dia. 45º, Supersteel High-intensity reflective film or harder film, up to 0.5 mm thick. CB15UA-K30 1.5mm dia. 60º, Supersteel (Japan 30º) High-intensity reflective film or harder film, up to 1.0 mm thick.